TMS Mechanism of Action - Changes in Brain Connectivity? Blog TMS Mechanism of Action - Changes in Brain Connectivity? TMS’s mechanism of action has been unclear. Transcranial magnetic stimulation affects activity locally in the region of the brain that is stimulated, but does that explain how it works? Since it affects local activity in every patient, why does it not work for everyone? A new article in Biological Psychiatry suggests that it may be changes in brain connectivity that are the key to TMS’s effectiveness. And by monitoring for these changes, it may be possible to predict who will respond to the treatment. 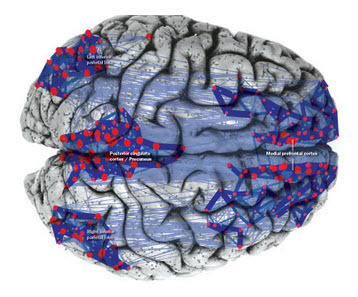 Recently it has become clear that there are networks of communication in the brain that serve different purposes, and these networks can be visualized using a special kind of MRI study called diffusion MRI. Two key networks of activity are the Default Mode Network (DMN) and the Central Executive Network (CEN). The Default Mode Network is the network that is usually active in the brain when there is no external stimulus and no particular task to be engaged in. Think of it as the “daydreaming” network – except that it need not be the kind of pleasant daydreaming that we may remember from childhood. There is evidence that people who are depressed spend more time using the DMN, and, in depressed people, activity in the DMN may be correlated with negative rumination – thinking about how bad things are. The Central Executive Network is active when planning some specific task. In this study, the authors found that alterations in the pattern of activity in the DMN was strongly correlated with depression, and they also showed that changes in activity in the DMN predicted treatment response. More specifically, they found that TMS seemed to create a shift in the relationship between two nodes in the DMN – medial prefrontal cortex and the dorsolateral prefrontal cortex. The medial prefrontal cortex is involved in threat assessment and (crudely) emotional decision making. The dorsolateral prefrontal cortex, which is where TMS stimulation takes place, seems to be involved in more thoughtful decision making, holding multiple ideas in mind and trying to understand before judging. The researchers identified that not only did DMN activity change in those who responded to TMS, but also an inverse relationship developed between the medial and dorsolateral prefrontal cortex (two parts of the DMN). A simplistic way of understanding this finding is that, with treatment the resting state of the brain shifted from negative emotion to a more mindful pattern of thought. This functional brain activity shift could, in fact, explain the mechanism of action of TMS. And, in any event, if an inexpensive way can be developed of visualizing this change, it may be possible to predict who is going to respond to TMS.